Whether you are an amateur, student, or professional musician, you probably have other responsibilities outside of music. So, it is important to know how to balance music and life. Like anything else, you need to make time for practicing and performing, but you can’t neglect your other commitments. I have recently accepted a full time job outside of the music and blogging fields, and so I have had to figure out how to keep up with everything. It takes time to figure out how you what you need to do to balance your time. But if music is something you love, you will make time for it, no matter your professional or personal life. 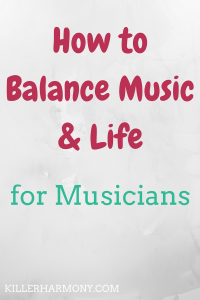 Here are a few tips and tricks to help you balance music and life. While it would be great to play music all of the time, that’s just not feasible. Even professional musicians need a break to focus on other tasks, like scheduling and emailing. If you have a job or classes outside of music, those things should take priority over music. It may be hard to focus on other things, especially for music majors, but it’s necessary. You can’t ignore your general education classes. The same goes for anyone working outside of music. You have to show up to work on time and do your job. That’s not something you can get out of. So keep up with your instrument when you can. If you can’t seem to practice as much as you would like, set a practice schedule. Work it into your routine. While it may be tempting to go watch TV after dinner, practicing first can help keep your love of music alive. If your schedule will be changing soon, try and create a practice routine to fit that new schedule. You don’t have to practice for hours (even you pros out there…). Just practice as much as you need to accomplish what you need. Time based goals can be great, but two hours of mindless practice don’t do you any good. It’s better to practice with and end goal for thirty minutes. Then you can actually evaluate what you did. When do you practice best? Are you an early bird? Do you work best in the evening? Can you practice during a lunch break? Figure out what time of day works best for you. Doing this will allow you to get more done in less time. Even with a goal, if you are not fully awake, your practice session won’t be worth it. If you are a professional, you may need to practice more, but you don’t need to spend hours playing. Practicing too much can cause you to develop a repetitive stress injury. You can ruin your vocal cords, develop tendonitis, or worse. You could hurt yourself to the point of having to stop playing. So don’t over do it. 4. Find music that you can play but will still challenge you. If music is not your profession, you probably don’t have a ton of time to dedicate to it. If that is the case, find music that is only slightly difficult. You should still challenge yourself, but you don’t need to take on the most difficult work for your instrument. Choose pieces that give you a small challenge, and be realistic about how fast you can learn them. If you are playing for fun, do just that. Don’t stress yourself out over learning a Hindemith sonata or a Mozart concerto. A small challenge will allow you to improve quickly so you can take on more advanced music later on. You don’t want to rush into anything too hard before you are ready. 5. Join a community group. Seek out community music groups and other playing opportunities to keep you motivated. If you are not in school and don’t have any professional groups to join, community groups are a great way to play with others. You can meet all different types of people, and you can come together to do something you love. Groups can also be a nice change from solo repertoire. You can expose yourself to more music. It also gives you an excuse to perform in front of people. There are tons of different groups, from choirs to bands to orchestras. You can also find instrument specific groups, such as a flute choir. The camaraderie you get from playing in a group can’t be matched by just playing solos. 6. Don’t stress about it. Having an off day and don’t feel like playing? That’s okay. While you might not want to make a habit out of it, everyone has those days where they just want to get under a blanket and watch Netflix. If you have a day where music just can’t fit, don’t stress too much. Music is supposed to be fun. If it doesn’t feel fun one day, then take a break. A small break from playing could help revive your passion the following day or week. How do you juggle music and life? Leave your tips and tricks down in the comments! And don’t forget to subscribe for exclusive music tips sent to your inbox!